Christine touched upon this last week, but Hillary Clinton just cannot get out of her own way. The Left complains that we’re talking about Clinton a lot. Yeah, that’s because she keeps injecting herself into the debate. She’s a woman who simply cannot let the 2016 campaign go. 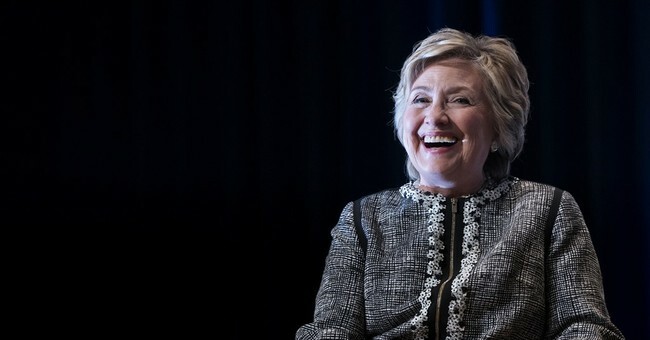 The title and cover of Hillary Clinton's highly-anticipated memoir about the 2016 presidential election was revealed Thursday — and the former secretary of state says she'll be "letting my guard down" in the book. In “What Happened,” the former senator, first lady and secretary of state dives into mistakes she made along the campaign trail and the “devastating” and unexpected loss to President Donald Trump, according to a press release. Yeah, sexism, double standards, and her image are well really not to blame for her loss. I know there are many reasons, but here’s a few reasons why “What Happened” is a fitting title for this comedy from the lady who simply does not know how to make a gracious exit. So, what did happen? It couldn’t be that no one trusted you? That character question sunk faster than the Titanic when it was discovered that you set up an unsecured and unauthorized homebrew email server, which handled all of your State Department communications, a truckload of which contained classified information. Yes, most were up-classified by the FBI when Clinton decided to hand over the server to the authorities, but three were declared classified at the time they were sent or received. The only saving grace was that then-FBI Director James Comey said that Hillary didn’t know the markings meant they were classified, despite the secretary of state being an original classification authority. Clinton didn’t care about the fallout; she should have. Dishonest and untrustworthy soon became popular words to describe the former first lady. It was compounded by her serial inability to give a straight answer about the server and why she set it up. It appears that it was clearly a violation of the 2009 regulation from the National Archives And Records Administration that stated all electronic communications needed to be recorded and stored by their respective agencies. She said no classified information was sent through the server. That was also untrue. She said that the State Department signed off on the server. Not only was this a falsehood, but also State’s inspector general said if she had come to officials with this request for a homebrew server—it would have been rejected. Clinton would give her last press conference in August of 2015. She would remain in the bunker until weeks before Election Day the following year. Nevertheless, her inability to explain this email fiasco led to her being defined by the GOP and voters as the same old Clinton from the 1990s: secretive, played politics all the time, and believed she could live by a different set of rules. Even Obama couldn’t believe that Clinton had set up this private server, adding that when she was exposed, her endless denials and evasions amount to political malpractice. Some people might postulate that this was the billion-dollar blunder that cost Clinton the election. I have no idea what election they were watching because Clinton did not reach out to these voters. She didn’t campaign in Wisconsin; she barely visited the Rust Belt at all. In the end, she lost this group by three-to-one margin. If it had been two-to-one, the outcome could have been different. This wasn’t necessarily a secret. Staffers knew that white working class outreach was lagging, but dared not anger the Queen Clinton. At the end of the day, the Clinton campaign was more focused on turning out the urban professional class (i.e. city folk) by harping on Trump’s bad behavior. No one cared. The Access Hollywood tape was actually laughed at among working class women, Alec MacGillis of ProPublica found that out traveling through rural America, along with the fact that Trump was brining new voters into the mix out here. Some people, who have been eligible to vote for two decades but didn’t, cast their ballot for Trump last year, their first vote for president in their lives. To them, Trump was an agent of change and had an economic message that resonated. Clinton did not. This letter, along with Russia, were some of the major points that Clinton pointed to for her election defeat. At Recode in California, which was held in June, Clinton actually peddled a theory of her own, that Americans helped the Russians disseminate damaging information gleaned from the DNC servers, which made its way onto Wikileaks. So, does any evidence exist that Americans colluded with hackers supposedly aligned with Russia to weaponize this information? No. It’s a conspiracy theory. Clinton also took shots at the DNC, for giving her such a shoddy data operation. In fact, she was given the Obama data machine, though Democratic tech staffers say that she just didn’t know how to use it. Concerning tech, her team tried to replicate the Obama team’s operation, but inadvertently may have turned out Trump voters. They also missed 7-9 million Obama voters who decided to flip for Trump. If there was a serious grassroots effort in the Rust Belt, they might have seen this sooner. Then, there’s the Clinton Foundation and the serial shadiness concerning donations from big donors, who then had very beneficial events, either politically or economically, occur once they left a check with this power couple. There’s the 180-degree turn on the Colombian Free Trade Agreement, the donations that occurred during the sale of Uranium One to Rosatom, a Kremlin-owned corporation, which placed twenty percent of America’s uranium capacity under Russian control, and the billions in arms deals to nations that gave millions to the Clinton Foundation; nations with appalling human rights records. In fact, all of this came about thanks to loads of cash flowing into this favor bank. It’s been described as a slush fund, which also didn’t disclose over 1,000 foreign donations. And again, despite her claims, Clinton has never been transparent about the Clinton Foundation. The former first lady will say sexism and misogyny played a part. Yeah, even Michael Moore said that was not true. Millions of people who voted for a man named Barack Hussein Obama, voted for Trump. It’s not true. I know this is just scratching the surface, and some of it is inside the Beltway jargon, but it all points to one absolute fact: Clinton was a bad campaigner, who ran a dumb campaign and lost. It’s similar to her 2008 bid, which also ended under similar, if not, identical circumstances. There literally was no difference. She lost to two candidates who promised to bring change, whether that be in the form of “Change We Can Believe In” or “Make America Great Again,” Clinton was unable to gain traction with the key groups to put her over the top. Could she have won if the election were held on October 27? Obama’s former communications director, Jen Psaki, was not confident. Mrs. Clinton, what happened was that the longer you stayed in the limelight, the faster your approval ratings dropped. The email server certainly rehashed all of the criticisms that were hurled your way during the 1990s. That killed you on character issues (i.e. honesty trustworthiness etc.) with primary voters, where young and older Democrats were split on your candidacy. And something I forgot to mention was the Bernie Sanders factory. The disheveled self-described Democratic socialist from the state of Vermont mounted a worthy primary challenge. He drew the adoration of young people, one of the cornerstones of the Obama coalition, and performed well with working class white in the Rust Belt. Sanders winning Indiana, Michigan, and Wisconsin were red flags concerning white working class voter support, which liked Sanders’ views on trade. Trump has similar views. Clinton was favored to win Michigan; Sanders pulled an upset. Oh, given the Rust Belt shock, it probably should’ve been a priority to actually campaign seriously in those states, instead of talking about the Access Hollywood tape. Besides the working class voter deficit, the young voter dislike of Clinton was probably another shock. The Obama coalition was not lining up behind her with the same enthusiasm as the former president. When you’re viewed as untrustworthy, shun half the population for supporting the other guy, don’t campaign seriously in key states, and feel that the coalition of the former president should automatically back you because of similar party affiliation, but don’t—then that could lead to an electoral defeat, which is what happened. Mrs. Clinton, you were just awful. Donald Trump is not a hard man to beat. He was eminently beatable. The election was one of the most winnable for Democrats in years—and you lost. It’s your fault. What also happened (and feel free to add your two-cents in the comments sections) is that the opposition defined you and you didn’t give a damn. You thought the Clinton name would get you over the top. Voters knew they weren’t getting Bill. So, I’m sure you will blame a lot of people but yourself. That’s fine. But many people, including members of your party, know what happened. Last Note: If Clinton isn't available to complain about Russia or Comey, there's always Pelosi.